The second chart doesn't surprise me given the fact that the Barnett Shale probably played a big part of the big spending between 2006 and 2008. With the big new shale wells, the decline rates are so much steeper than conventional wells, so the aggregate decline rates will increase with the addition of new shale wells. But I have some difficulty reconciling the relatively flat production with the great and unsustainable increases in spending (and drilling). 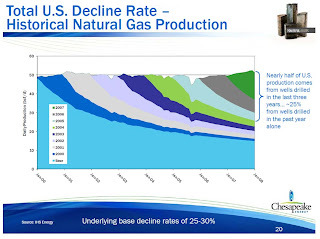 It makes me think of a chart that Chesapeake likes to use to prove that the steep decline in rig count will soon lead to a sharp drop in gas supply and an increase in the price of natural gas. 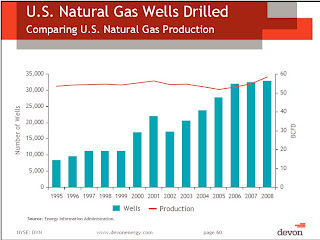 When half of the U.S. gas production comes from wells less than three years old, the first Devon slide starts to make sense. But then I think of comments by Petrohawk CEO Floyd Wilson, who recently said, "(w)e are growing production almost without trying." 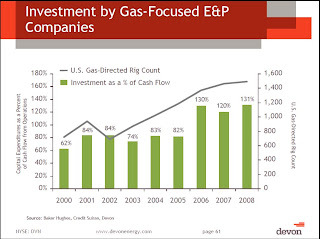 The big wells his company has hit in the Haynesville Shale has led to production increases even though they have cut back on drilling. Will that soften the impact to supply from the sharply lower rig counts? All of this makes me wonder if we will see a big supply drop-off and commodity price increase in the next six months. Robert, I'm not an economist, but it seems to me that these three charts, taken together, support the idea that the recent reduction in rig counts will necessarily reduce supply and support a higher price. The first chart indicates that an increasing number of wells are required to maintain a relatively constant supply. The second chart supports the proposition that the producers can't afford to continue producing without a price increase. The third chart confirms the steep Haynesville decline curves. So, all of this taken together seems to say that supply and demand is working as it should to correct the supply and price imbalance. I see Floyd Wilson's statement more as a general comment on the consistent nature of the Haynesville play. Just offered for whatever it's worth. Keep up the good work. Terrific blog. I guess the underlying question is will the decrease in supply be as pronounced as expected given the fact that so many new wells are coming out of the gate so strong? What is important to remember is that companies (most notably Chesapeake) are choking back the wells as soon as they start flowing, waiting for higher prices. Hopefully that will counteract the "big well factor."